A large rockfall on the Jurassic Coast has sparked renewed warnings about walking on cliffs and beaches. The fall, which has been described as "enormous", is thought to have happened early on Thursday morning close to Hive Beach, Burton Bradstock. The National Trust has urged people to stay away from the area as heavy rain has made further falls likely. It happened close to where Charlotte Blackman, from Heanor, Derbyshire, died in a landslide in July 2012. The 22-year-old was killed when a 160ft (50m) cliff collapsed and some 400 tonnes of rock fell. 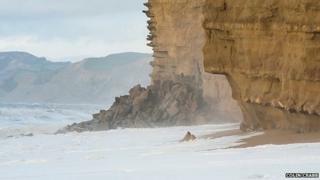 Ray Beer, from Bridport, said he had seen the cliffs "looking precarious" while walking his dog earlier in the week, before seeing the rockfall. "The sea has been coming right up to the cliffs. It is enormous - a massive great fall," he added. Caroline Richards, Jurassic Coast ambassador and events manager at the nearby Hive Beach Cafe, said: "There are lots of pieces of rock along the cliffs which look like they are going to go. "Our message is to come and enjoy the views but please, please, use common sense, be vigilant and don't go scrambling over rockfalls." Dorset County Council said the fall happened about 200m (650ft) from Hive Beach. Richard Edmunds, the authority's earth science manager, said the area above the beach had already been fenced off as a precaution. A 1,300ft (400m) section of coast path at the top of the cliff was also diverted inland last year following concerns surrounding the area. Mr Edmunds urged members of the public to heed the warning signs along the "eroding coastline" and stay away from the cliffs.